Long, eight-point slide guides and highly rigid frame construction assures high dynamic accuracy, this maintaining long die life. A special link motion mechanism provides optimum slide velocity which assures consistent product quality, and greatly reduces vibration and noise. 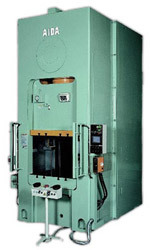 Because of reduced clearance, the punch will not plunge into the die cavity as much as in conventional presses which results in quieter press performance, minimized vibration and extended die life. The AIDA Hydraulic Overload Protector (HOLP) operates instantaneously to protect the die and the press should overloading occur. By incorporating the die cushion within the bed, the press pit becomes unnecessary. This can greatly reduce foundation costs and facilitate press room layout changes.